"Now that you have 25 mouths screaming different curses and 50 feet running in different directions, you have a perfect simulation of every birth defect and psychological disorder known to science, and are ready for a grand adventure." —Seanbaby, "Understanding the World of Warcraft Using Super Mario Bros."
The Massively Multiplayer Online Role Playing Game, or MMORPG is, as the name suggests, a roleplaying game with hundreds, thousands, or even hundreds of thousands of players all connected through the Internet. Most of these games are "pay-for-play", with gamers registering an account with their copy of the game and buying play time in monthly increments. The MMORPG has its roots in text-based Multi-User Dungeons (MUDs) and Multi-User Shared Hallucinations (MUSHes) originating in the mists of time. Eventually, sprite-based graphics were introduced in 1991 with Don Daglow's Neverwinter Nights (not to be confused with the traditional computer RPG of the same name by Bioware). While games like Meridian 59, Sierra's The Realm and Ultima Online kept the genre alive throughout the 90s, it wasn't until 1999 that EverQuest put the entire genre on the map by introducing a gigantic and deeply fleshed-out fully 3D world for players to explore from a first person or third person perspective. 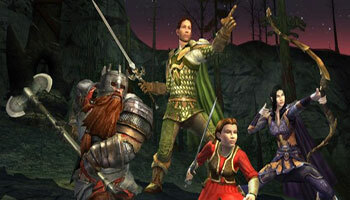 EverQuest would pave the way for which a great majority of the games listed below owe their conceptual existence to, though elements of the MMORPG are Older Than They Think, since they can be traced back to Dungeons & Dragons. Mumorpugers add a social and collaborative element to standard gaming, which obviously alters the experience. It creates the possibility of team-based gameplay elements; as anyone can tell you, playing a soccer video game by yourself, with only the AI as company, is not nearly as fun, spontaneous or challenging as having friends over. Now imagine 40-a-side soccer, 'cuz MMOs can do that. MMORPGs provide quests or dungeons which can take dozens of allied adventurers at once (and bosses that require them), or "Player vs. Player" zones where duels or team matches can take place. The competition between "Guilds" (player-organized adventuring parties) can get heated (just a little), and there's always one more boss to kill or piece of loot to collect. Innumerable friendships, both online and in Real Life, have started or been maintained via MMO games. There's even a bit of an industry grown up around it, where people pay real money for in-game objects, currency or even characters; some companies discourage this, while others facilitate it or even make it part of their own economic model by selling such things themselves. Having said that, you're paying a monthly fee, anywhere from $10 to $15, for this game. The math does line up; if you bought (say) Tales of Symphonia at $50 when it came out and then played it for 50 hours, all you need to do is play your MMO at least 15 hours a month to keep up the same monetary efficiency. And some people find 16 hours a week to be a slow pace. Nonetheless, the whole ongoing-fee thing does rankle gamers who are just getting into the genre for the first time. While free-to-play MMOs do exist, they often contain reduced content, or restrict certain features to people who are willing to pay. Furthermore, because an MMO company's livelihood is in those monthly subscriptions, it's in their best interests to make the game as draggingly slow, nitpicky, indirect or tedious as possible. Of course, get too un-fun and people stop playing, so MMOs are constantly figuring out ways to give you little achievements that keep you interested (to the point of allegedly employing "Skinner Box" operant conditioning techniques to keep you playing like a lab rat pressing a lever for a reward). Gotta Catch 'Em All is a big part of the genre's addictiveness: there's often a wide variety of Side Quests the player can choose to achieve, and pursuing them will often bring the player's character all the way up to maximum level. Finally, the team-based aspect of the game can make victory a dicey proposition; depending on the game and the situation, just a single Leeroy Jenkins can result in death for all forty of his teammates. In other words, you can lose even if you play perfectly, because someone else screwed up. Note that not all massively multi-player games are Role-Playing Games; for instance, PlanetSide is a Massively Multiplayer First-Person Shooter, Auto Assault was a Driving Game with RPG Elements, Drift City is what you get when The Fast and the Furious is turned into an MMOG, Second Life is a social environment, Shattered Galaxy is a Real-Time Strategy with RPG elements, and Magic: The Gathering Online is a straight port of the Collectible Card Game where the only "Massive Multiplayer Online" part is the lobby where you connect with other players. Massively Multiplayer RPGs are the most common, so common in fact, most people actually don't realize that the first three letters of the term "MMORPG" refer to "Massively Multiplayer Online" and that there can very easily be such a thing as an MMOG that is NOT an RPG. Nowadays, if you refer to a game as an MMOG, the first thing people will think about is this. For tropes related to MMORPGs, see: An Adventurer Is You, Allegedly Free Game, Perpetually Static, Alt-itis, Fake Longevity, Fake Difficulty, Fake Balance, Fetch Quest (and subtrope 20 Bear Asses), and the ubiquitous Level Grinding. Ragnarok M Eternal Love: It's mobile-based 3D reincarnation. Tokimeki Memorial Online (Taken down in 2007). "The World" from the .hack anime, manga, and games. Defictionalized at one point in Japan (under the name Fragment, the name of The World's beta version), but it flopped hard and wasn't released anywhere else. Fragment (The real world one) wasn't as much an MMO as it was the first four games repackaged with an online mode. You could choose one of the pre-existing character models or a recolor and that was the extent of customzation outside class choice. The dungeons had to be made by players and were stored on their PC. There was an offline mode which was mostly the first four games with your "Custom" character replacing Kite and Rena and Shugo added as extras. A version appears in the Lucky Star OVA. And it looks awesome! "Mythic Quest" in obscure doujinshi series Mythic Quest. One episode of Chobits involves the main cast enjoying their time with a free trial of an MMO. They come across a boss that is said to be impossible to beat, but Chi hacks the game and makes it possible to beat it. None of them are aware of how this happened, and Hideki decides that playing MMO's wouldn't be healthy for him or his budget anyway. Sword Art Online is notable for featuring several advanced virtual reality MMO games, one per major plot arc. The first one has the players trapped in it until they beat the final boss, or die... which kills them in real life too. The subsequent arcs get rid of this and show the players' life both online and offline; the plots spawn both worlds and the dichotomy between players and their characters becomes a major plot element. In a few episodes of Welcome to the N.H.K., Sato becomes addicted to an MMO game called Ultimate Fantasy. It makes him even more of a loser than he already is, and he becomes totally detached from reality, until his best friend snaps him out of it. Only Sense Online features a virtual reality fantasy MMO of the same name and the series revolves around one beginner player and his (mis)adventures in the game. Elder Tale, a long-running fantasy RPG set in a post-apocalyptic Earth, gets a new game update as all logged-in players suddenly experience The Game Come to Life in the light novel/anime Log Horizon. As Yggdrasil, a long-running immersive fantasy MMO closes down for good, a player by the character name Momonga, the guild leader, decides to stay online. But he's unexpectedly awakes inside a new reality of the castle of his guild's own making, with NPC attendants now alive, in the light novel/anime Overlord (2012). Fafnir from Miss Kobayashi's Dragon Maid ends up getting addicted to MMOs after coming to Earth (since they appeal to his love of killing and hoarding valuables), to the point that he spends up to 21 hours per day playing. Recovery of an MMO Junkie, as the title indicates, deals with a NEET who spends most of her time playing the MMORPG Fruits de Mer along with her companions. Yureka Has Lost Saga and mentions of two "earlier" games. It has a MMORPG called World of Warquest. It's a very-thinly disguised World of Warcraft, which author Bill Amend plays. For example, one series of strips revolved around Jason's efforts to get the "Kingsquisher" title; in World of Warcraft, you earn the title "Kingslayer" by killing the Lich King (the Expansion 2 Big Bad). One Foxtrot comic featured a rare and powerful World of Warquest weapon named "Doomulus Prime." An actual quest reward mace named Doomulus Prime was later added to the real World of Warcraft game. Knights of the Dinner Table has "World of Hackcraft", the MMORPG spin off of the "Hackmaster" Table Top RPG. The plot of Friendship is Optimal involves the release of Equestria Online, and later players uploading themselves to live in the virtual world. Major spoiler ahead: At the end of the first part of The Keys Stand Alone, The Soft World, the Pyar gods' reboot of C'hou turns out to be a virtual telepathic MMORPG designed and overseen by Jeft Indle, one of the two Big Bads of With Strings Attached. 20,000 players, at least 50,000 �Natives,� and uncounted numbers of AI personalities; hundreds of Towns and Cities of Adventure with plenty of comforts and mundane entertainments as well as adventures; endless dungeons, ruins, monsters, quests, and other exciting RPG stuff; reality mimicking down to the atomic level; and an overarching theme of Good vs. Evil, with endless scheming and sniping between the players as they struggle to obtain the pieces of the Nine-part Key to the Black Tower, make it a gamer's paradise. Not so much for the four, though, who are there quite unwillingly. The Piers Anthony novel Killobyte is about just such a game, in Cyber Space. His novel Steppe features a protagonist who is thrust into a live MMORPG, where players act out their roles in a historical setting, dropping out of the Game when they are "killed" and re-entering if they can afford to buy new parts. Although originally written in 1972, Steppe foresaw many of the conventions of the MMO as we know them. The Metaverse from the Neal Stephenson novel Snow Crash. Halting State by Charles Stross is about a bank robbery in a MMORPG. ½ Prince Has Second Life as a fantasy MMORPG, a shooter that appears in one chapter, and others mentioned. Otherland describes a future Internet that is composed of interactive virtual reality environments, so the entire thing is essentially an MMO writ large. More specifically, the "Middle Kingdom" is an extremely popular VR fantasy MMORPG, and several of the environments of the titular Otherland network are designed to mimic game or fantasy worlds, with visitors directly inhabiting the avatars of characters in the simulation. Mogworld is set in one. T'Rain in REAMDE, specifically designed with gold farming as a core gameplay from the ground up (it helps that the author of the idea used to be a drug smuggler and money launderer). It also notably uses Real Life geological algorithms to generate the terrain (hence the name of the fictional world). Additionally, characters have "bot-haviors", automated actions performed by them while the player is logged out, which depends on the type of character (e.g. a warrior trains, a miner mines). The Other Plane, from his groundbreaking novella, "True Names", is an extremely early (1981) example, almost predating the IBM PC. In Rainbows End, the development of wearable computers with contact-lens displays and gesture-based input has made these even more common and popular than they are today. People can and do play them on the streets, while traveling to work or school. Ready Player One has OASIS, which is a cross between this trope and Cyber Space (partly because logging in involves using VR goggles and haptic gloves). Given that the novel takes place in a Post-Peak Oil Crapsack World, a great number of people across the world tend to spend much of their time in OASIS. In fact, there are schools and universities in OASIS, which are at least as good as those in reality. Magisterus Bad Trip has Money (Game) Master, with a number of players estimated as ranging from 5-200 million. It is considered Serious Business, with the in-game economy having significant influence over the real economy. However, it lacks many game conventions such as quests or a level up system. This is because (unknown to most) it was never intended to be a game, but is actually a simulation of the real world. In Star Ocean: Till the End of Time, the plot twist is the universe is an MMORPG for higher dimensional beings. Mega Man Star Force has the ever popular Burger Quest. The aforementioned Phantasy Star Online 2 also has an in-story version of Phantasy Star Online 2, which coexists with the universe the game itself is set in. Try to wrap your head around that one. RE: Alistair begins in the fictional MMO Rivenwell Online, and the story begins due to an in-game incident. All three dateable boys play the same MMO. Elf Only Inn is an example of a webcomic set inside an MMORPG. Though it was formerly set in a chat room, it moved its entire cast into a new MMORPG, and while they do have outside lives, we don't hear about them too often. In the webcomic BitmapWorld, the teenage characters from the strip play an MMORPG called Cosmic Dungeon. The Cosmic Dungeon strips are almost a comic-within-a-comic. The Sluggy Freelance story arc "Years of Yarncraft" is all about spoofing MMORPGs (though the strip calls them MMORGYPOOs: Massively Multiplayer Organized Roleplaying Game Yarn Providing Outward Obnoxiousness). Most of it focuses on a World of Warcraft style game, but a bass fishing MMORGYPOO is briefly featured as well. "Clichequest" from The Noob which satirizes MMORPGs. MegaTokyo features Endgames, a Medieval European Fantasy MMORPG that Piro, Largo and Miho all played at one point. The game, along with standard statistics like "Strength", "Magic" and so forth, had hidden "Emotional Statistics" built into the player characters to add depth. Miho cheated by manipulating the Emotional Statistics of a vast number of other player characters, bringing them under her control via statistical More Than Mind Control. Piro was too in-tune with his character's Emotional Statistics for her to be able to manipulate them, and Largo's character ignored them completely. Sarab has the nelPLAY, a fantasy MMORPG. Magience is about a MMORPG that may be more than a game. The SCP Foundation has SCP-896 , an MMORPG where, if the player uses their own name as the avatar, their stats in real life will start corresponding to that in the game. For example, increasing strength would cause the player in real life to become stronger, stamina would make them more durable, etc. The Onion parodied World of Warcraft in a video about an MMORPG that lets the gamer play a gamer playing World of Warcraft. The entire series The Guild is about a group of MMO gamers playing an unnamed World of Warcraft clone. Except they're rarely shown playing it... A recent episode reveals the game they've been referring to as "the game" is actually titled The Game. Noob has Horizon, in which most of the action happens. The Kim Possible episode "Virt-U-Ron" revolved around a fictional MMORPG called "Everlot" (the title likely being a mish-mash of EverQuest and Dark Ages of Camelot). World of Warcraft was the focus of the South Park episode "Make Love, Not Warcraft", as the boys tried to deal with an overpowered "griefer" who kept killing everyone else's characters and threatened to bring about the end of the world... of Warcraft. Cites "Hello Kitty Island Adventure" as a major rival to WoW. American Dad! : Steve and his friends were fans of an MMORPG named Dragonscuffle in "Dungeons and Wagons". Hayley, wanting to talk to Jeff after dumping him, used her account to bring Steve's recently-killed character back to life. He wanted to be her boyfriend again, but she'd already found someone while playing the game. Danny Phantom had "Doomed", which was so addictive that Danny was able to play it from evening until morning without realizing it. Bart dominated Earthland Realms on The Simpsons, which was basically a bloodthirsty (bloodthirstier?) Medieval Fantasy version of Springfield. At one point, Marge, being the loving mother she was, bought him some items in the form of a Hello Kitty expansion pack.